Mocha was given to me by a close family member! It was a the prefect time in my life because at the time I received her I was pregnant and I just lost my baby and she filled a empty spot in my heart. She's my heart and I love her to death! I started to think of a unique dog name to give her so I look at her ears and notice that she had slight tan colored ear bend into her white beautiful coat, so I came up with name Mocha which matches with the coffee (mocha latte). The "La" later came along to give her a full name. Join in and write your own page! It's easy to do. How? 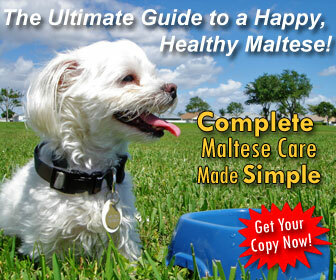 Simply click here to return to Maltese Dog Names. Tatonka is Native American for buffalo and I think one of the most unique dog names. 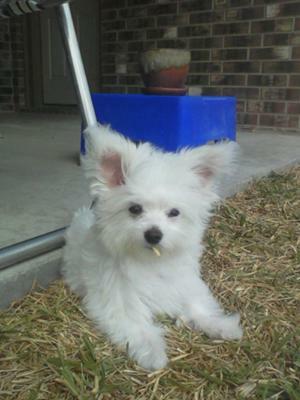 When I first saw the little Maltese in the kennel with 2 Chihuahua's and a Chihuahua mix I thought of him as a buffalo with those tiny little dogs. My son wanted to name him Biscuit so he might be called that also or instead. 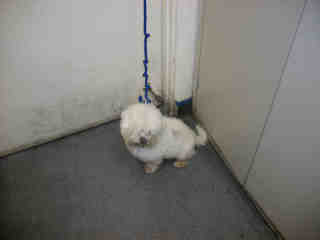 We will not get him until Monday as we are rescuing him from the pound. 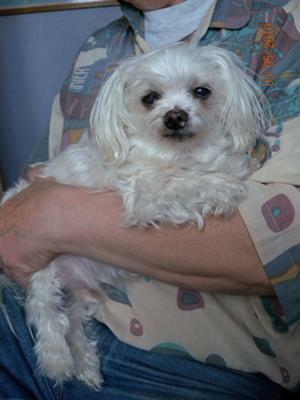 We are wine lovers and thought our wonderful Maltese deserved a fine wine name so he is named after the wine "Opus One." He was adopted during Mardi Gras and from Louisiana hence his full name "King Opus" but he goes by Opus. i think your pet's name Makita is really cool. it's unique and cute. I chose this French dog name because I waited 15 years to find another small dog that I really wanted. 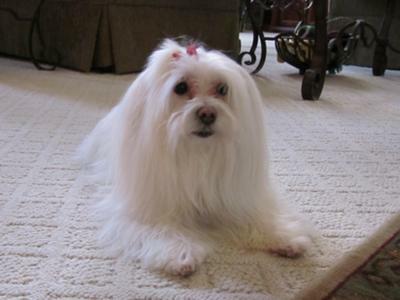 I had once lived in Monte Carlo and loved their names for everything... "Bijoux" means "Jewel" in French, and my Maltese is my precious jewel! I never had children, so of course, now I have a "four-legged daughter"! I came up with some unusual dog names for my Maltese. Solitaire (Solly) was named due to being one twin living (therefore leaving a solitary one), and Famous was named because his Registered name is Aussie Idol and Aussie Idols become famous. We were looking for unique dog names and wanted our Maltese dogs nickname to be Koda so we changed Lakota with a "T" to Lakoda with a "D". We named him after the Lakota Souix Indian (Native American) tribe. He lives happily with my family and I in Wisconsin. I had always wanted a Maltese and after begging my mother for months, she finally gave in. I had often talked about wanting to name the puppy "Motley" when I got him as it was a fun and unique dog name. Coincidentally, when I found a local breeder and decided the little one he had available was a possible fit, I came to discover the breeder's last name was no other than Motley! When we visited for the first time, he had such a fun personality and was a little white ball of cotton bouncing all over the place. The meaning of Motley is colorful and I could not pick a better word to describe his personality. For us, this is the perfect name! What a great name for such a colorful personality! I got my beautiful male Maltese cross from RSPCA at 3yrs and he is so lovable, I named him after noting the perfume fragrance "JOOP" and we have had no problem him responding to it. My previous beloved male dog "HOOCH" had gone to rainbow bridge at 14 yrs, the two names are entirely different, yet to me they are nice, short and direct easy names i believe my dogs can relate to. 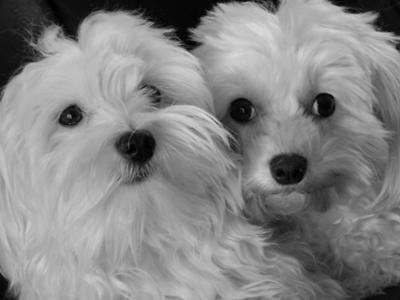 Hi I am 32, live in the North of France and am the happy owner of 2 beautiful Maltese dogs : Laly and Kenji. I came up with these unique dog names when I got Laly 5 years ago. It was quite unexpected as I had some fears regarding dogs at that time...I kept her in my arms when we left the shop and her name came to me, don't ask me how and why!! just sounded well, I did not have to think hard! 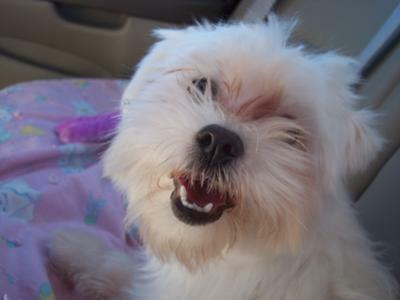 she's my little honey, we are so "linked" to each other, as if we could understand each other just by a look..
Ambrosius was the name of the Old English Sheepdog in the movie The Labyrinth, starring David Bowie. I was looking for a unique dog name and Ambrosius was the name of the fictional pup from the fantasy portion of the film. I sadly had to put my Old English Sheepdog, Jax, down this past winter. 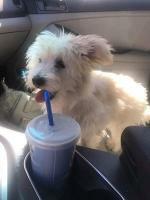 I named my Maltipom Ambrosius in honor of Jax. 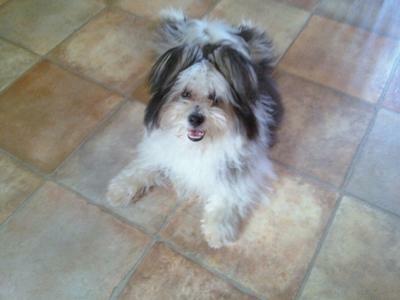 Ambrosius actually looks like a miniature version of an Old English Sheepdog since he is grey and white! Love the musical My Fair Lady and he was such a gentleman, so sophisticated and handsome that my niece thought that Higgins would be a good name. He responded so well to it that became his name. He was registered as Handsome Higgins. You notice I say was. I lost my baby four years ago he was due to be fourteen the following year. My heart will never heal from the loss of this special little man. Little dogs are just lovers and I loved him with all my heart. My daughter came up with one of the most unique dog names. She has a aunt in Nicaragua and the aunt owns a dog. The name is Charlie but she cannot say Charlie and sound like Chawie when she called the dog. That's how and why she came up with the unique dog name of Chawie. He had that name when we got him. Although it's one of those weird dog names, it fits him good. Swiffer is snow white and so funny he likes to get his pic taken we take pics all the time. He even stands and shakes your hand. He is so much fun, we love him dearly. I will put pic up soon. 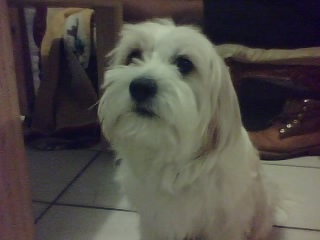 My male Maltese was Mr. Swiffer, Swif/Swiffer for short. Loved him, lost him (died Aug 2010), miss him. I just had to rate your dog's name with five stars as my 4 l/2mo old baby boy is a Swiffer too. He was such a ball of fur when I brought him home and he picked up all the dust on the floor. He just reminded us of a Swifter mop so we changed it alittle. He loves to play and slides across the floor with ease. I think it's a funny, but very cute name! Perfect. Love it! My Swiffer doesn't think his name is weird! He is white and fluffy and picks up everything on the floor or in the yard, suits him just fine! We don't have a name for him when he was a puppy but I remember one celebrity that the fans always call him Papi. I think it's a funny dog name that fits him well. 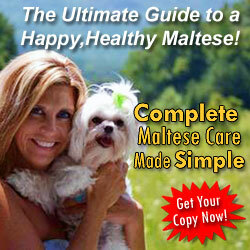 This is how we can up with our unusual dog name for our Maltese. Noddy's pedigree name is 'Must be magical of Lambsgove'. We had chosen the name Misty but decided that went he walks his head nods the apt name was Noddy. 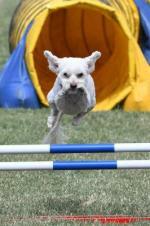 Our Maltese is now getting on in age 13 going on 14! Our Noddy is still going strong ...in his 16th year now. Sadly he has the start of dementia. Still sleeps all day - I say that is what he does best ! Noddy is now in his fifteenth year. His hearing isnt too good and he loves his sleep ! His name is Sir Lovkins but mostly we just call him Lovkins cause he is just a little ball of love :) I was going to name him Trigger, but when I saw him all I could do was love on him so this unique dog name just stuck.